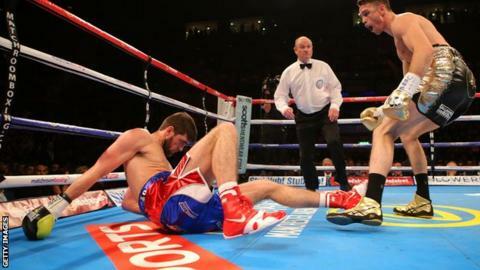 Callum Smith stopped Rocky Fielding in the first round to claim the vacant British super-middleweight title in the all-Liverpool contest in the city. In an eagerly-awaited showdown between two unbeaten fighters, Smith floored Fielding within the first 30 seconds. When Fielding was felled for a third time, referee Phil Edwards stopped the bout at the Echo Arena. Smith is the fourth brother from his family to hold a British title, an unprecedented feat. The 25-year-old, who had won 12 of his previous 17 bouts by knockout, stunned his opponent with a flurry of punishing body shots. Fielding, 28, had 21 victories under his belt going into the fight and briefly rallied before being caught again and sent to the canvas. Smith swarmed all over his former amateur team-mate who was unable to hold out for the bell. The win could now move Smith into the mandatory challenger position for the WBC super-middleweight title held by Sweden's Badou Jack - who recently claimed a unanimous decision against Briton George Groves.